The challenges facing farmers today are huge, with uncertainty around changes to CAP payments and questions about how farming will be valued in generations to come. Climate change and extreme weather events, biodiversity loss and soil erosion, cheap imports and rising costs are all threatening the viability of UK farming in the future, leading to farmers either leaving the business altogether or experiencing burnout. 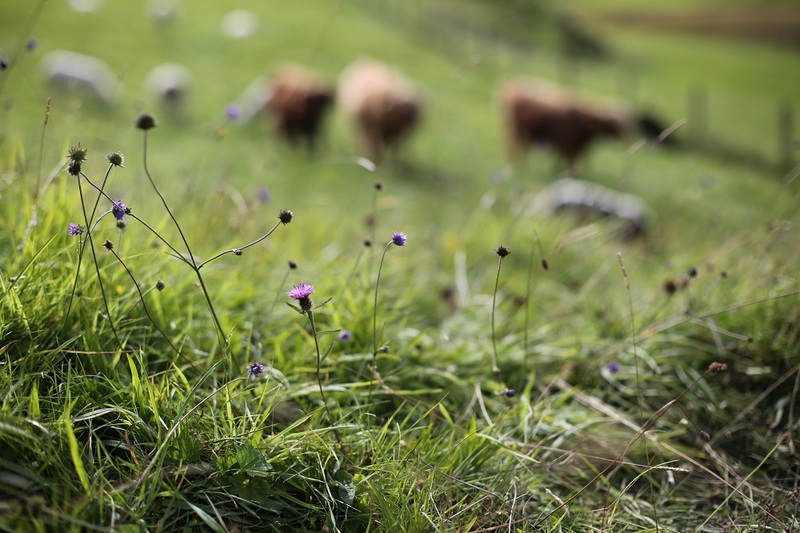 The film Tall Grass Grazing was shot during last summer’s drought and shows farmers across Scotland trialling ‘mob grazing’ - sometimes called holistic planned grazing or multi-paddock grazing. It’s a type of rotational grazing that involves a high stocking density, frequent moving of livestock using electric fencing and a long rest period, leading to taller grasses with deeper root systems and greater sward resilience. The farmers have come together in a Soil Association Scotland Field Lab, the only one of its kind in the UK, to support each other in this new technique that often involves wider changes on farm, and to try and measure mob grazing’s capacity to regenerate soil, increase grass diversity and improve animal health. It felt like the start of something exciting when we had our first meeting in Fife last October - that buzz and confidence that comes from trying something new together. We have a WhatsApp group to share tips and problems. Everyone’s got different skills to share and are keen to support each other through the process of developing or making changes to their grazing plans. Some farmers within the group have become committed to holistic management, which is a decision-making framework that’s all about looking at the whole farm system and how everything works together to benefit the social, economic and environmental sides of the business in equal measure. For Bryce Cunningham (pictured right) at Mossgiel Farm in Ayrshire, for example, who had inherited depleted soils and recently converted to organic, he needed to improve soil health and the productivity of the sward to make his grass-based dairy system work effectively. At Balcaskie Estate in Fife, estate manager Sam Parsons is interested in using holistic management to lengthen the grazing season and reduce their winter housing bills, at the same time as creating meaningful work for everyone and ensuring employees are involved in decision-making. And of course, like anyone, the farmers in the group are looking for a work-life balance that allows the farm to work for the family, rather than the other way around. I made the film because I think holistic management has huge potential for land managers of all scales to improve the resilience of their farms and find ways to make a decent livelihood. I've visited a number of farms in England and Wales where I’ve seen holistic planned grazing systems in action, and I wanted to find out who was doing it in Scotland. I wanted to show a range of farmers and crofters giving it a go, find out what they're learning, what challenges they experience, and share these stories with the wider Scottish farming community. I also wanted to share the beauty of carefully designed farming systems that work with nature not against it - creating healthy, functioning ecosystems that produce nutrient-dense, healthy food for people. Above all, I wanted to challenge the notion that livestock farming is inherently unsustainable or unethical. Watch the film here or above. To follow the progress of the field lab join our Facebook group Mob Grazing Scotland. "I am an experienced project manager, visual artist, facilitator and aspiring micro-dairy farmer. I have 15 year's experience working in the charity sector delivering participatory projects, training and events that seek to reconnect people with food and farming in Scotland. My work is founded on community development principles and a belief in the value of regenerative farming. I have specific expertise in horticulture including market gardening, Community Supported Agriculture, orchards and urban farming systems. I also have experience of holistic management, creative facilitation methods, video production and co-design processes. I manage the Field Lab element of the Farming for the Future programme at Soil Association Scotland - bringing land managers together with researchers to find real-world, practical solutions for common farm problems. Get in touch if you have an idea for a Field Lab or would like to find out more." Dear Clem, I met you at Christine Page's farm. This is another fantastic film. Thank you.